All devices on the Emerson wired network must be registered to an Emerson user account. For devices like computers that have web browsers, when you connect and open your browser, you should be directed to a registration page. You can also manually register other wired network devices, such as game consoles. For the security and integrity of our network, your computer should be up to date before registering your computer. For more information about keeping your computer up to date, refer to our guide on Basic Computer Maintenance. Also required if you are using a Windows PC is some form of anti-virus protection. By registering for and using Emerson's network, you are agreeing to Emerson's Electronic Information Policy. Familiarize yourself with it, as well as other Emerson College IT Policies. 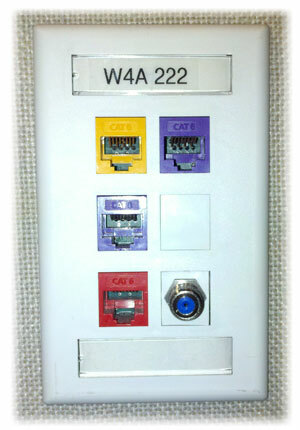 Connect your computer to the purple wall jack with an ethernet cable. If you do not have an ethernet cable, one can be purchased at the Emerson Bookstore, or Staples, Radio Shack, or Best Buy, all nearby. Depending on your campus location, you may find other color ports, as seen to the left. Yellow ports are for phones, but purple is generally the only one you'll need. Emerson's network registration system, Clearpass allows you to log in with your Emerson username and password, and to register the network MAC address of the computer you are using. Your system can get online via either system. Log in with your Emerson username and password to register your computer. After your login is accepted, the registration page instructs you to unplug your wired connection, reboot your computer, and re-plug your network connection. Click on Connect My Computer on the left side. Enter your Emerson username and password and read the Policy Guidelines before clicking on the button marked I agree to the above policy and wish to register my computer. That's it! Restart your computer to complete the network refresh and gain access to the network. Desktop computers, laptops, and mobiles devices with the latest security patches. Any specially requested firewall rules, proprietary/non-standard network equipment. Specialty devices that require static IPs or firewall rules must be placed as a request to IT. Applications that pass clear credentials over the network. Computers that do not have latest security patches.